There are a number of excellent walks directly from the house into the undulating Moray countryside. It is possible to walk for miles through woodland and moorland, to take in the tranquility of the Moray countryside and admire the stunning views. We have a large drying room for wet days. The Tomintoul Spur climbs twice to 1800ft and to very exposed locations. Walkers must ensure they carry suitable clothing for all weather conditions. The Dava Way is a 23 mile trail across the ancient Celtic province of Morayshire linking the historic towns of Forres and Grantown-on-Spey. Almost all of the route follows the old Highland Railway line and is off road and safe from traffic. 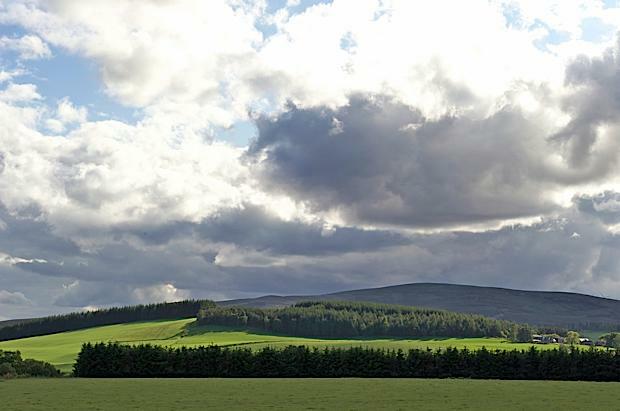 You climb from the Spey Valley to cross Dava Moor before descending to the Moray Firth; passing through a pleasing mix of farmland, woodland and moorland as you do so. If linked with the Speyside Way and the Moray Coastal Trail it forms a unique long distance circular route of about 80 miles. The coastline and settlements of Moray are linked by a waymarked coastal trail of approximately 50 miles from Findhorn to Cullen and all the places between. The route can be extended from Findhorn to Forres along a section of cycle route. An ascent of Ben Rinnes will reward you with excellent views in all directions, taking in much of North East Scotland and as far afield as Caithness. There are a number of different ways to the summit of Ben Rinnes - from to the south, from the distillery to the north and from the high point of the road to the east. All are good and straightforward walks. At Glenlivet admist open expanses of heather covered hills, clear rushing burns and rivers, sheltered straths, glens and woodlands, you will find some of the finest scenery in the Grampian Highlands. There is a variety of way-marked walking trails for your enjoyment on Glenlivet Estate, from gentle short strolls to longer hill walks. In addition there are a number of historic hill tracks and 'whisky roads'. A trail map is available from the information centre.